2018 marks the 50th anniversary of “Hair: The American Tribal Love-Rock Musical,” and UNC Greensboro’s School of Theatre will celebrate with its own production of the iconic counterculture rock-musical starting tonight (Sept. 25). For many of the nearly 100 theatre students involved in the production, “Hair” has offered ample opportunities for self-expression and free-form creativity, things as definitively sixties as the musical itself. Performances will run Sept. 25-30. For showtimes and tickets visit vpa.uncg.edu or call the Triad Stage Box Office at 336-272-0160. Don’t forget that UNCG Theatre offers UNCG faculty/staff the opportunity to attend all its shows this season for $45. This is $50 off the price they would pay if they bought individual tickets to all the shows. This offer applies for your partner/significant other as well, so buy a pair. Details are here. Read the full story about the “Hair” production here. *Please note Hair contains strong language and adult themes. Every First Lady has to figure out the role as First Lady. “There is no job description,” says Dr. Jody Natalle, associate professor of communication studies. Natalle is keenly interested in First Ladies, particularly the manner and impact of their communication skills. Her new book is “Jacqueline Kennedy and the Architecture of First Lady Diplomacy,” published by Peter Lang.” It’s a project she has worked on for twenty years. People have their conception of her as First Lady – for example, they may recall Ms. Kennedy giving a televised tour of the White House, Natalle explains. She has not been given enough credit as an excellent communicator and diplomat. That “meek” speaking style was strategic, Natalle says. It forced the listener, in one-on-one conversations, to lean in and engage with her very personally. She analyzed the person. “She and her husband would have discussions afterward,” Natalle says. He’d learn a lot from her about the person, their motivations and trustworthiness. “This thing they called Camelot? She was quite mistaken in (later) calling it that,” Natalle says. “The US was under threat of nuclear annihilation.” Ms. Kennedy was highly aware of that, Natalle notes, even as the Kennedy years were romanticized after the fact. “She was kind of a nerd. Her intellect was her biggest gift.” She spoke five languages, matched among First Ladies only by Melania Trump, who also speaks five languages. Her “soft-diplomacy” work was an important part of US diplomacy during that trying time, the height of the Cold War, Natalle notes. Whether through daily letter-writing, her building bridges with other nations through her fashion, her forging ties with the French government by helping bring the Mona Lisa to the United States for a blockbuster exhibition, helping see the Temple of Dendur preserved at the Met Museum when the Aswan Dam was built (and in the US helping ensure there’d be adequate funding for the Egyptian dam project), she accomplished a lot. Her scholarly opinion of Melania Trump as First Lady? “She has not been as visible” as other modern-day First Ladies so far, she says. A 2017-18 Global Engagement Faculty Fellow at UNCG, Natalle had been a Sorensen Scholar at the Kennedy Library in 2007, allowing her to conduct a good deal of research. Natalle notes that Jacqueline Kennedy Onassis is the only First Lady in the modern era to not write a memoir. In fact, she only gave one interview to a scholar. Books such as hers are very important to understand the importance of her role in history. In fact, Natalle is part of a steering committee of scholars and government professionals who are organizing a national First Ladies association with the intent to bring interdisciplinary research to both academia and the public. Natalle will give a lecture based on her new book Thursday, Oct. 25, at 4:30 p.m. in the Alumni House, Virginia Dare Room. It is free and open to the public. Photograph, public domain. 28 June 28, 1962, opening of the refurbished Treaty Room, White House. Abbie Rowe, White House Photographs. Courtesy, John F. Kennedy Presidential Library and Museum. 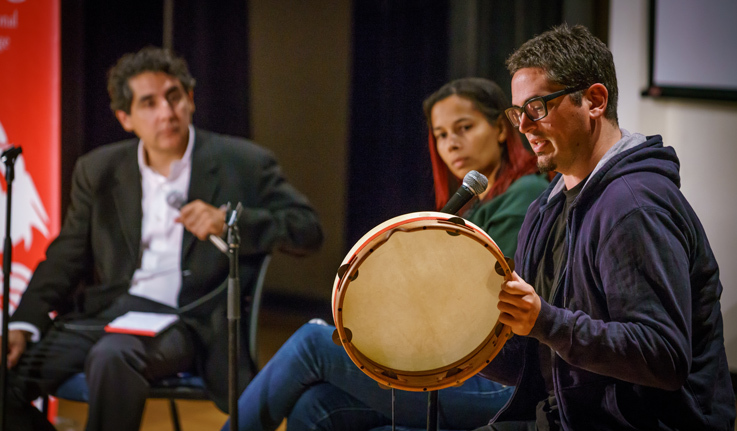 The Grammy recipient and MacArthur Fellow joined multi-instrumentalist Francensco Turrisi and historian Dr. Omar Ali in the discussion “Bilal’s Songs: Mixing and Re-Mixing the African Diaspora and Islamic World” in UNCG’s EUC Auditorium Sept. 10. The genesis of the evening’s panel was a series of conversations they had been having about the African Diaspora, history of Islam and intersections of the two. Ali, in tracing some of the history to start the evening and give context for the audience, noted that fifteen to twenty percent of enslaved Africans taken to the Americas were Muslim. He showed maps of the African continent, the Middle East and east Asia, explaining history and making connections. He also explained that several notable slave revolts in the Americas were led by Muslims. Francisco Turrisi is a “musical alchemist,” Ali said. Turrisi loves the music of the southern Mediterranean. He explained that Sicily, where his mother was born, had once had a strong Islamic musical and cultural influence. He spoke a good bit about international variations of what people in the United States call a tambourine – and the rich differences in how these instruments are played in various countries. And he spoke about influences and connections he has experienced. The native of Italy recalled an epiphany. “I could hear in (American) old-time string band what I hear in jazz.” It led him to check out the Carolina Chocolate Drops. He recalled the first time Giddens, a member of the Carolina Chocolate Drops, played him some instrumental tunes. “I swear I could hear rock and roll,” though they were in fact 1850s era minstrel tunes. The EUC event was an evening of making connections and seeing influences, musically, culinary and linguistically. Both Giddens and Turrisi had been performers at the N.C. Folk Festival, which ended the day before. Giddens, who studied as a Music graduate student at UNCG, and Ali both spoke about Omar ibn Said, a Muslim enslaved in the Carolinas in the 19th century. Ali noted that a mosque is named for him. Giddens told the audience she has been working on a project about Omar ibn Said. She noted the North Carolinian wrote his autobiography in Arabic. The evening concluded with a very Turkish sounding song, her banjo sounding similar to an oud and his playing his tamburello with Arabic/Muslim influence. As UNC Greensboro continues to grow, so does its faculty. The University has welcomed 97 new faculty members across six colleges and schools for the 2018-19 academic year. UNCG’s newest faculty span a range of backgrounds, academic disciplines and research interests. The SECC Kickoff will be held today 11-1 p.m. in the EUC’s Cone Ballroom. All faculty and staff are invited to enjoy great snacks, learn from many of the SECC charitable organizations, enjoy the speakers, and take part in the drawings. The Weatherspoon Art Museum at UNC Greensboro has announced the establishment of the Sherrill/Gingrow Docent Education Endowment Fund, the first of its kind to provide transformational opportunities for docent education and gallery instruction programs at the museum. Volunteer Weatherspoon docent Sydney Sherrill Gingrow and her sister Sharon L. Sherrill established the endowment in memory of their parents, Clark A. and Norma D. Sherrill, who championed both art and education. Despite neither having college degrees themselves, Clark and Norma Sherrill celebrated their daughters’ college degrees and subsequent careers in higher education. Clark was a WWII Naval veteran with a later career in public works, emphasizing recycling and waste management. He also held patents on several inventions, one being the first front-ended leaf loader. His wife, Norma, was a homemaker, consummate bookkeeper, and accomplished bridge player. In his seventies, Clark became a self-taught artist, creating thousands of sculpted and carved assemblages, both representational and abstract. His love of art influenced his granddaughter, Alex (B.A. Guilford College, M.F.A. SCAD), who is an accomplished artist herself. As Clark and Norma became more financially able, they established a charitable foundation and entrusted their daughters Sherry (B.A. Guilford College, M.A. Wake Forest University, Ed.D. UNCG) and Sydney (B.A. and M.S. University of Tennessee) with identifying institutions that reflected the Sherrills’ shared vision of justice, equality, and diversity through arts and education. The Sherrill/Gingrow Docent Education Endowment Fund will be used to enhance volunteer docent education and gallery instruction programs at the Weatherspoon Art Museum. The Weatherspoon’s Docent Education program began in the early 1960s and continues to play an invaluable role by introducing youth and adults to modern and contemporary art. Currently, the program’s twenty-five volunteers engage with more than 5,000 visitors annually through guided tours and visual literacy classes, while also serving a growing number of K-12 and college students, families, and adults with special needs. Contributions to the Sherrill/Gingrow Docent Education Endowment Fund are welcome. For further information, please contact Sarah Kathryn Coley, director of development, UNC Greensboro at skcoley@uncg.edu, 336-256-0495, or visit alumni.uncg.edu/docented. Dean John Kiss spoke to the Triad Business Journal about the potential for growing plants on Mars. The article. Yes! Weekly wrote an article on UNCG’s receiving of the 2018 Higher Education Excellence in Diversity award. Kim Record, director of athletics, spoke to the News & Record about the extension of UNCG’s licensing agreement with IMG College. The piece. The News & Observer and Charlotte Observer highlighted alumna Monica McGee for her American Sign Language interpreting during Governor Cooper’s hurricane updates. The article. The News & Record wrote a feature on the UNCG School of Theater memorial on Sept. 29 in honor of two deceased theater professors and an alumna. This event is part of UNCG’s interdisciplinary series “the ’60s: Exploring the Limits,” a rich and curated lineup of performances, lectures, films and exhibits engaging members of the campus and the broader community throughout the year. For a complete listing of events, visit sixties.uncg.edu. Have you downloaded the University’s new PowerPoint slides? The current ones look great! Every speaking engagement is an opportunity to incorporate the University’s brand and your affiliation with UNCG. UNCG branded templates for PowerPoint and Google Slides are available for all your presentation needs. These templates are easy to use and allow a consistent look for your audiences. Both widescreen (16:9 aspect ratio) and standard screen (4:3 aspect ratio) formats of the presentation templates, as well as detailed instructions, can be found near the bottom of the Web and Emedia Brand Guide page. The 2018 Brand Guide also provides information on other opportunities to present a consistent University identity. From updating email signatures and web fonts and colors to updating logos on electronic and printed materials, you can help the University achieve its strategic goal of building a strong, highly visible and distinctive brand. The UNCG School of Theatre will hold a remembrance gathering to honor the lives of two storied theatre faculty members and an alumna on Saturday, Sept. 29, at 3 p.m. in the Sprinkle Theatre, Brown Building. The gathering will celebrate the lives and careers of Marsha Paludan, Alan Cook and Marian Smith through shared memories, music and photographs. That evening’s performance of “Hair” will also be dedicated to them. Marsha Paludan served the University for 17 years as a teacher, director, advisor and mentor. She coordinated the movement curriculum for the BFA and MFA actor training programs, bringing to her students an eclectic blend of the Alexander Technique, developmental technique, Yoga, Tai Chi, Viewpoints and contact improvisation. In 2001, she won the UNCG Alumni Teaching Excellence Award. Also an accomplished director, her UNCG productions included “Miss Julie,” “The Sound of Music,” “Equus,” Emily Mann’s “Greensboro: A Requiem,” “An Evening of Kyogen Plays” and Mark Adamo’s opera based on “Little Women.” She retired from UNCG at the end of the 2008-09 school year. Alan Cook came to UNCG in 1991 and retired as head of the MFA directing program 2007. Cook directed more than 100 plays in venues across the globe, including the Actors Theatre of Louisville, the Magic Theatre in San Francisco and the Jos Repertory Theatre in Nigeria. Marian Smith graduated from Woman’s College (UNCG) in 1949 and received numerous awards for her work for the arts, including the UNCG Alumni Service Award, induction into the UNCG Theatre’s Hall of Fame and the North Carolina Theater Conference Distinguished Career Award, which was renamed in her honor. See more in this News and Record article. If you love music, get ready for a remarkable five days. The UNCG School of Music will present several big concerts in the coming days – starting with a Wind Ensemble performance Thursday night. Most concerts are free admission and will take place at UNCG or in nearby Greensboro churches or downtown venues. In the listing, click the event to see more about the performance. And enjoy the outstanding artistry. Looking to help those in need, as a result of Hurricane Florence? UNCG’s Human Resources notes that if you would like to help, you can sign up through the State’s volunteer website or Giving to UNC landing page (if you wish to give, under Designations, click View All Giving Opportunities and see Disaster Relief Fund as an option) Alternatively, employees can provide support through the upcoming State Employees Combined Campaign (SECC), through many different organizations. UNCG Student Affairs has compiled a page of helpful information about how you can help, with a variety of websites and ways to make a difference. Visit https://sa.uncg.edu/support-hurricane-florence-relief-efforts. Also, Staff Senate will sponsor a drive for the Spartan Open Pantry. Their food resources were in high demand in recent weeks, the Staff Senate leadership tells CW. Donation sites are being determined – details are forthcoming. UNCG’s Chief Information Security Officer Bryce Porter advises people to be wary of scams. Think before you click. Do not click links in unsolicited emails offering to help you donate money to hurricane victims – and be suspicious of social media pleas. You can contact 6-TECH at 336-256-TECH (8324), 6-TECH@uncg.edu or https://6tech.uncg.edu for help with any emails or websites you feel may be malicious. The IX International Conference of the Hispanic Association for the Humanities (HAH) took place in Caceres, Spain, June 19-22. As president of the HAH since 2016, Dr. Carmen Sotomayor organized the IX International Conference with a team of colleagues from the HAH Board of Directors (Dr. Adam Winkel from High Point University, and Dr. Kyra Kietrys from Davidson College) as well Dr. Victoria Pineda, Dr. María Luisa Montero Curiel, and Dr. Diana Villanueva Romero from the University of Extremadura (Spain). The congress was titled “Contributions and Challenges of the Hispanic Cultural Tradition in a Global Society”. With over 180 participants from several countries, such as Canada, Chile, Colombia, Ecuador, Holland, Japan, Mexico, Poland, Taiwan, Spain and the USA, the conference explored a variety of current issues in the Humanities. The program included presentations by philologists, linguists, specialists in cultural and cinematographic studies, as well as literary studies, and second language acquisition specialists. Besides the individual presentations and two plenary sessions, the conference offered two round tables focusing on the work of contemporary Spanish artists from Extremadura “West XXI: Arts and Literature in Contemporary Extremadura” and a round table moderated by Dr. Sotomayor, called “Extremanegra: the black novel in Extremadura” with the participation of three Extremadura novelists: Eugenio Fuentes, Susana Martín Gijón and Luis Roso. The X International Conference will take place in June 2020 under the auspices of the University of Malaga, in Southern Spain. Shelton is Vice Chancellor of Research and Engagement and the Carol Jenkins Mattocks Distinguished Professor. This project will increase school readiness and success by improving the quality of the early education and care experiences for infants and young children, the abstract notes. More specifically, Bringing Out the Best (BOB) builds the capacity of early education and care providers, Pre-K teachers, directors/administrators and families to reduce behavioral challenges and support social and emotional development through evidence-based prevention and intervention services. In summary, the impact of this project will be to intervene early to support children who will be ready for school and ready for life. BOB continues to play an important role in advancing the mission of the Guilford County Partnership for Children to support, educate, connect and advocate through the services it provides for children, early educators and families. BOB fulfills a critical need to provide services where no comparable services exist. The purpose of the project is to design and field-test The Science of Essential Balance (SEB) curriculum for high schools. The project seeks to develop a 40 lesson curriculum to teach the science of energy-balanced living. The curriculum will incorporate mobile technology to deliver course assignments that lead students to engage, experiment, explain, elaborate and evaluate data they collect from themselves about nutrients intake and expenditure. Learning the science of energy balance will provide opportunities for students to study the relationship between nutrition, exercise and health, and between nutrition, exercise and injuries using scientific inquiry processes. According to the abstract, the project will determine whether levels of stress among working mothers are related to increased obesity risk in their children. It will use novel methods such as ecological momentary assessment to examine within-day mother-to-child stress processes that contribute to children’s long-term obesity risk in an accumulated manner over time. Working mothers and their 9 to 11-year-old children will participate in six semi-annual assessment waves across three years. Dr. Linda Hestenes (Human Development and Family Studies) received a continuation of funding from the NC DHHS Division of Child Development and Early Education for the project “North Carolina Rated License Agreement Project.” Dr. Steve Hestenes and Dr. Sharon Mims are co-principal investigators on the project. The purpose of the contract is to conduct activities related to the assessment portion of the NC Star Rated License, including receiving requests from Division of Child Development and Early Education consultants, scheduling assessments, conducting valid and reliable assessments, delivering assessment scores and reports, responding to grievances, and conducting outreach sessions. Dr. Harriette Bailey (Human Development and Family Studies) received a continuation of funding from the Guilford County Partnership for Children from a partnership project. Dr. Linda Hestenes is co-principal investigator on the project. The SECC kicks off in one week. And you are invited to the celebration. UNCG’s State Employees Combined Campaign (SECC) will start its 2018 campaign with a Kick-off and Agency Fair next Wednesday, Sept. 26, from 11 a.m. to 1 p.m in the EUC’s Cone Ballroom. The SECC – the official giving campaign for state employees – helps support more than 900 charitable organizations across our community, state and beyond. Approximately 40 charities will be on hand at the event, to answer any questions you may have about their work and their impact. Light snacks will be provided, and drawings will be held every 15 minutes for qualified attendees, including a Grand Prize Drawing. There will also be an Online Pledge Assistance Station for those wanting assistance navigating their pledges online, as well as an “I Support” station to share your personal experience with one of the many organizations supported through SECC. UNCG donors can be confident in the impact their dollars will be making. “The SECC was established as a medium to assure state employees and retirees an avenue and opportunity to support charitable organizations that are accountable, fiscally sound, and committed to improving the quality of life in our state, nation and the world,” she added. Wade Maki, UNCG campaign chair, invites all faculty and staff to come enjoy the event. “Attending the kickoff is a great way to learn the various ways we can make a positive difference in our communities,” he said. Updated to include last four paragraphs 9/19. For 2018-19, UNCG presents a campus-wide collaboration: “The ‘60s: Exploring the Limits,” a series of events that draws inspiration from the extraordinary decade of the 1960s. It was a time of upheaval and transformation, and the themes still resonate today: civil rights, freedom of speech and expression, feminism, political divide, environmental concerns and expanding boundaries in technology and culture. The yearlong series, designed by a faculty and staff steering committee from across the University, follows other interdisciplinary series “War and Peace Imagined” in 2016-17 and “Globe and Cosmos” in 2014-15. 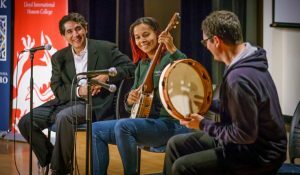 A selection of fall events are listed below, and in spring, look forward to a concert by jazz legend Herbie Hancock, a photography exhibit about the Freedom Riders and Freedom Schools, and films and discussions dedicated to protest and music, including a symposium on the Grateful Dead. For more information about the series as a whole, and to see additional events, view the website here. The UNCG School of Theatre presents the story of active, bohemian “Age of Aquarius” youth in New York City, advancing ideas of gender and racial equality and fighting against conscription into the Vietnam War. For showtimes and tickets, visit UNCG Theatre or call the Triad Stage Box Office at 336-272-0160. Hear from Dr. Elmira Nazombe about how the civil rights movement shaped, and continues to influence, the modern fight for racial, economic and social justice. Free and open to the public. Acclaimed pianist Lara Downes will present a program of Bernstein’s “Anniversaries for Piano” along with 20 newly commissioned Anniversaries on the occasion of the composer Leonard Bernstein’s Centennial. Bernstein’s son Alexander will provide narration to the works. For tickets, visit ucls.uncg.edu. Dr. David Biggs will give a lecture about the film that sparked global anti-war protests and galvanized budding environmental movements. Free and open to the public. For more information, visit the event page. The School of Dance presents a piece created by choreographers Bill T. Jones and Arnie Zane, which is an artistic response to the 1966 Freedom of Information Act. Screening and discussions of parts I and II of the Grateful Dead documentary. UNC Greensboro Facilities Operations is on schedule to complete a safety fencing project along West Gate City Blvd., in mid-October. The project, which began in early July, will see the installation of safety fencing along the south side of West Gate City Blvd. The fencing will run from the Kaplan Center for Wellness parking lot to Lofts on Lee, providing coverage for all University property along W. Gate City Blvd. The fencing will guide pedestrians to crosswalks and corners where visibility is highest to facilitate safer crossing for students. In addition to fence installation, some landscaping and sidewalk repaving is are also planned. Periodic lane closures on West Gate City Blvd. can be expected until the project is completed in October. The Gardner Award is awarded by the UNC Board of Governors and has been given annually since 1949. The Board of Governors solicits nominations from UNC campuses in the fall semester each year, and a BOG committee decides on the system-wide winner during the spring semester. The winner receives a cash prize and recognition at the May BOG meeting. Those chosen in the past have been persons who have made notable contributions of national or international scale. See information regarding last year’s winner here: 2018 O. Max Gardner Award Winner. The role of our UNCG Faculty Senate-based committee is to solicit nominations, recommend the campus nominee to the Provost and Chancellor, and assist with preparation of the nomination materials that are put forward to the Board of Governors. To better honor our campus nominees, Provost Dunn as allocated a $1000 award for our campus nominee. One thing to note about the award criteria: the award is based on the significance of accomplishments made during the past year. Of course, big accomplishments almost always arise after an extensive history of work. So, don’t discount putting forth a nominee whose long-standing work has culminated in an interesting way over the past 12 months (we can put forth nominees multiple times). For more information on our past nominees, our committee, and the nomination process, please visit the Provost’s O. Max Gardner Award information page. The deadline to submit nominations is Friday, October 26, 2018. Feel free to forward this to others; nominations are encouraged from all on campus. Questions? The committee members may be seen here. 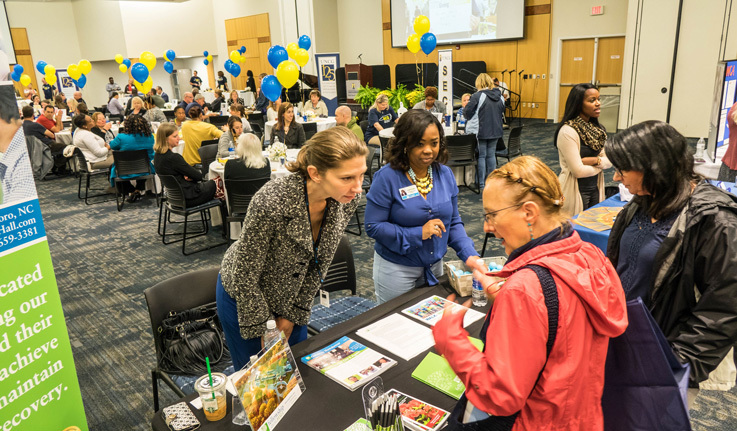 UNCG will welcome Spartan parents and families to campus for the annual Spartan Family Weekend event from Sept. 21-23. Families will see campus through their students’ eyes while enjoying activities and events alongside other Spartan families. UNCG’s Women and Gender Studies department, as part of its Dylan Rose Kadis and Eloise Hall Kadis Women’s Lecture Series, will host “We’re Here Too: Feminism in Science Fiction and Fantasy,” a presentation by Nalo Hopkinson. Born in Jamaica and residing in Riverside, California, Hopkinson’s nine novels (including “Brown Girl in the Ring: and “Midnight Robber”) draw from Caribbean history and tradition, feminism, and social and cultural issues. Her writing has won a variety of accolades, including the World Fantasy Award and the Locus Award for Best First Novel. In addition to her writing, she has edited several anthologies and teaches creative writing at the University of California, Riverside. Hopkinson will be discussing the science fiction and fantasy community’s reputation as a boy’s club, and the writing of women and other minorities that that attitude marginalizes. She will also talk about her personal experiences living and writing as a woman of color. The presentation will be Wednesday, September 26, at 4 p.m. in the EUC Auditorium, with a reception to follow. Entry is free. On Friday, September 21, from 8 am to 6pm, the UNCG Classical Society and the UNCG Philosophy Club will perform a dramatic reading of Plato’s Republic, in its entirety – all 10 books. You are invited to swing by at any point during the day to join in. The event will be by the Minerva statue behind the EUC. If you’d like more information, including how to volunteer to be a reader, you can get it here: http://goo.gl/rZqXPf. The acclaimed actor opens this year’s UNCG UC/LS with a special presentation this Friday (Sept. 21) at 8 p.m. in UNCG Auditorium. Tickets may be purchased via this page or at the Triad Stage Box Office, (336) 272-0160. There is a special price for UNCG faculty, staff and retires as well as students. Alda, through his writing and lectures, shares fascinating and powerful lessons from the art and science of communication, and teaches how to improve the way you relate to others using improv games, storytelling, and your own innate ability to read what’s probably going on in the minds of others. With his trademark humor and frankness, Alan Alda explains what makes the out-of-the-box techniques he developed after his years as the host of PBS’s “Scientific American Frontiers” so effective. One of TV Guide’s 50 Greatest Television Stars of All Time, he has starred in series such as “M*A*S*H,” “30 Rock,” T”he West Wing” and “ER.” Among his recent science-focused work, he hosted “Brains on Trial,” a neurological look at brains in the courtroom. He also wrote “Radiance: The Passion of Marie Curie,” a play about the personal life of the scientist who discovered radium, and presented “Dear Albert,” a stage-work he wrote based on letters written by Albert Einstein, for the World Science Festival in 2016. He published his New York Times bestselling memoir “Never Have Your Dog Stuffed—And Other Things I’ve Learned” in 2005. His second bestseller, “Things I Overheard While Talking to Myself,” came out in 2007. Alda’s latest book, If I Understood You, Would I Have This Look on My Face? My Adventures in the Art and Science of Relating and Communicating, was released in June 2017. A book signing will follow his lecture Friday evening. This afternoon UNCG and UNCG Medicinal Chemistry Collaborative (MCsquared) hosted event is free-admission, but space is limited. Please click on “Register” to RSVP at this page: HERE. University Libraries will sponsor a workshop for UNC Greensboro faculty on Wiley Researcher Academy—a comprehensive, online platform pedagogically designed to deliver effective training on writing and publishing to authors across the entire global community. This new program will help your students be more successful in getting their manuscripts accepted by quality, peer-reviewed journals. Topics covered include the benefits for researchers and faculty, an overview of the platform, learning courses, the registration process, facilitation, mentoring and a Q & A session. Two workshops will be offered for faculty tomorrow (September 20, 2018) at 3 p.m. and 4 p.m. in Room 177A of Jackson Library. Refreshments will be provided. Visit https://tinyurl.com/WileyResearcher3pm or https://tinyurl.com/WileyResearcher4pm to register and reserve your space today. 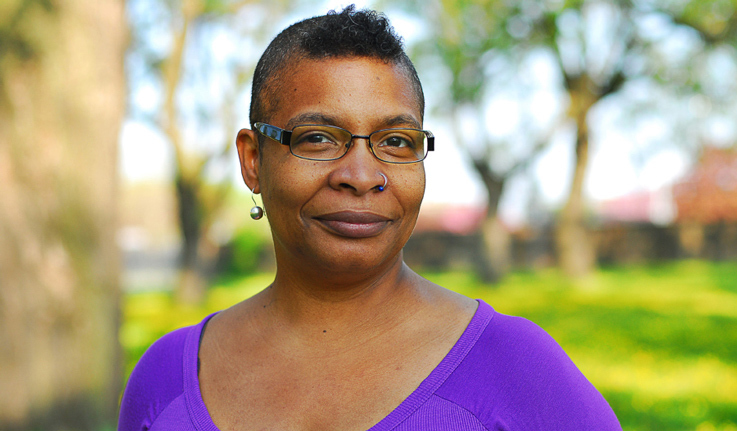 Today, poet, teacher, and scholar Stacey Waite visits our campus from the University of Nebraska-Lincoln. Through the support of the English Department, the MFA Program, the Women’s and Gender Studies Program, the Office of Intercultural Engagement, and the Humanities Network and Consortium, faculty and graduate students will have several opportunities to engage with Waite’s work. On Wednesday, Sept. 19, from 1 to 2:30 p.m. in MHRA 2711, Waite will offer a pedagogy workshop titled “Queering Classroom Norms,” open to all instructors across campus. On Wednesday, Sept. 19, from 4:30 to 6 p.m. in the MHRA Humanities Lounge, Waite will hold an open discussion with graduate students about professionalization, research, academic careers, and more. Again, all are welcome. Waite’s most recent book, Teaching Queer: Radical Possibilities for Writing and Knowing, is available digitally through the UNCG library, Dr. Applegarth (English) notes.. The Office of Intercultural Engagement is recruiting student participants for the Fall 2018 Spartan-In- Dialogue program. Spartans-In-Dialogue is a 5-week interactive dialogue experience designed to build relationships across difference and explore topics related to racial identity, race relations, and intersectionality. Participants will learn more about their identities and perspectives and understand others who are different while practicing dialogue skills to communicate effectively about difficult topics. Participants will learn communication, group dynamics, and diversity skills that can be documented on the co-curricular transcript to help with employment, graduate, and professional schools. Undergraduate and graduate students are encouraged to sign-up at intercultural.uncg.edu/spartans-in-dialogue through September 27. Any questions about the Spartans-In-Dialogue program, contact carla.fullwood@uncg.edu, 336-334-5090.